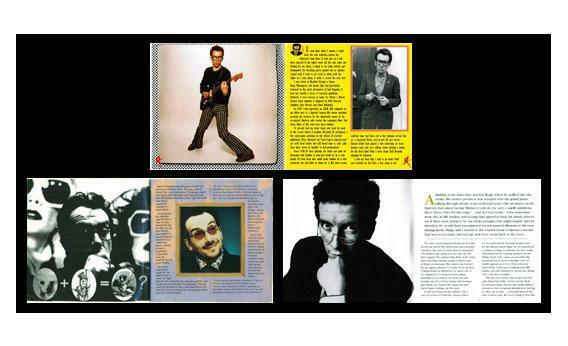 Elvis Costello memoir: Autobiography in Rhino reissue booklets. 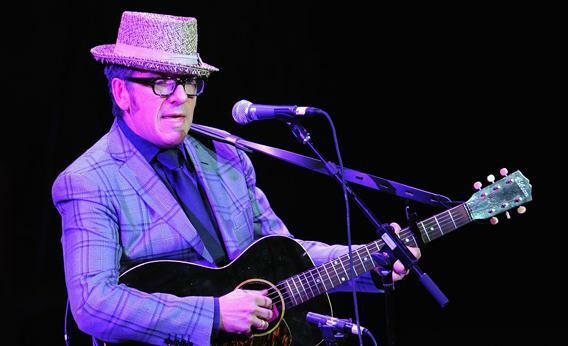 Elvis Costello’s rock-star memoir is one of the best ever. It was written for 17 CD booklets, and it might never see the light of day again. Photograph by Larry Busacca/Getty Images. Thirty-five years ago, a gangly 22-year-old named Declan MacManus quit his job in a London lipstick factory and adopted the stage name Elvis Costello. Stiff Records was about to release his debut LP, My Aim Is True, and had signed him to a contract that could support his wife and young son. With the windfall, Costello bought back the copy of A Hard Day’s Night that he’d pawned to afford the previous month’s gas bill. Costello has never been overly forthcoming about his personal life, so it might be surprising to hear that he divulged this humanizing anecdote, and many others, in one of the best rock-star memoirs of the last decade. His story is more music-oriented than Patti Smith’s Just Kids, less self-aggrandizing than Keith Richards’ Life, and more revealing than Chronicles Pt. 1 by Bob Dylan. Unlike those books, Costello’s memoir hasn’t won any awards or appeared on any best-seller lists—fact is, it doesn’t even have a title or a publisher. But between 2001 and 2006, Costello authored 17 long reflective essays to accompany Rhino Records’ full reissue of his 1977-1996 catalog. These reminiscences add up to more than 60,000 words—longer than The Great Gatsby—and they provide the only intimate firsthand look at one of the most written-about pop careers of all time. I spent a lot of time with just a big jar of instant coffee and the first Clash album, listening to it over and over. By the time I got down to the last few grains, I had written “Watching the Detectives.” The chorus had these darting figures that I wanted to sound like something from a Bernard Herrmann score. During my visits to Hollywood, I found myself sitting around hotel rooms late at night with other songwriters, drinking and swapping stories and songs. This was entirely new to someone who had started out in the rather more insular and competitive London scene. I would meet a lot of interesting characters in [King of America producer] T-Bone [Burnett]’s company over the next few years, including Jerry Lee Lewis, Willie Dixon, Harry Dean Stanton, Kris Kristofferson, and Lucinda Williams. There’s a long and well-documented history of English musicians fleeing gray Britain for America. What differentiates Costello is the great leap he made to incorporate those genres into his own music, against expectations. This Year’s Model and Armed Forces, his first records with his rampaging band the Attractions, were quintessentially British, full of amphetamine-boosted tempos, rancorous class politics, and eloquent wordplay. Clearly anyone who made such a statement had little or no knowledge of the critical hyperbole that can rain down on even the slightest talent before the bloom goes off the romance in pop music. I had found myself being taken too seriously and over-analysed from the very outset of my recording career. Photo illustration by Jane Zitomer. All This Useless Beauty, Costello’s last record with the Attractions, was released in 1996 and reissued by Rhino in 2001. It’s a mature and ruminative album, full of songs that Costello had written either for or with other artists. “None of these lyrics contained any anger toward the characters,” he writes, “only disappointment that they had settled for so little. I could just as easily have been talking to myself.” Though he leaves the source of his self-disappointment unspecified, Costello hasn’t approached this kind of frankness in any interview or writing I’ve seen elsewhere. It’s particularly startling given that he was only five years removed from the record in question. But by then he had already inaugurated the obsessively dilettantish approach that has distinguished his post-Attractions career. Since 1996, Costello has appeared intent on leaving no creative opportunity untaken, whether hosting a talk show on basic cable or releasing a symphony, Il Sogno, in 2004. It’s a career path that has put all but the most devoted fans off his scent, though the Costello revealed in these mini-memoirs is both more humble and more expressive than some disappointed fans might think him to be after the last 15 years. Whatever the merits of his recent albums (and a few are quite good indeed), he has come to embody a searching and catholic kind of musical fandom that only seems more appropriate now, when seemingly all of recorded history is available to anyone with an Internet connection. (His 2002 Vanity Fair article “Rocking Around the Clock,” which lists his favorite music for all 24 hours of the day, simply begs for a Spotify playlist.) Most musician memoirs are an indulgence for author and reader alike, but Costello’s is the rare one that actually conveys the musical mind and shows how complex and generous it can be. Even if, like me, you’ve listened to 1982’s Imperial Bedroom countless times and admired the Attractions’ melding of styles over its 15 songs, it’s still stunning to read the tangle of allusions that Costello unravels in his essay. He explains that his listening habits at the time included Billie Holiday and Frank Sinatra, Erik Satie and Debussy, Miles Davis and the Left Banke. “Now as an adult,” he writes, “there was certainly something attractive about the way these records felt out of step with fashion and had a connection to so many musical threads.” That’s Costello’s late career in a sentence: chasing musical connections no matter how far afield of fashion they lead him. No wonder he took half a decade to write his memoirs—and then let them escape with a shrug.